Heat oven to 350°F. Make cookie dough, using oil, water and egg, and bake as directed on package. Cool completely. Spoon about 1 teaspoon of marshmallow creme on the bottom of half of the cookies. Top each with a second cookie, bottom side down; gently press together. In small saucepan, heat peanut butter chips and shortening over low heat, stirring frequently, until melted and smooth. Spoon about 2 teaspoons peanut butter mixture over each cookie, spreading with back of spoon over top and side. Place on waxed paper. Let stand 30 minutes or until set. 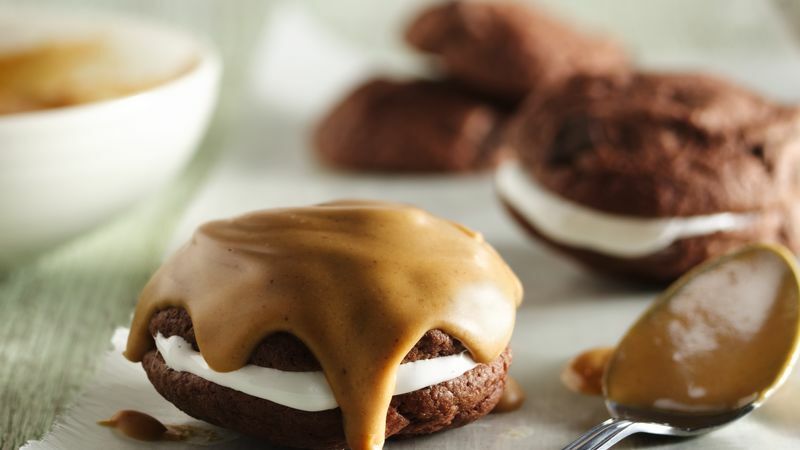 If you love peanut butter cups, you'll love these cookies. My children received a candy for Valentine's Day that gave me the idea to make these chocolate sandwich cookies with peanut butter on the outside.